Tissue plasminogen activator (tPA, tissue-type plasminogen activator) is a serine protease found on endothelial cells (cells that line the blood vessels) involved in the breakdown of blood clots (fibrinolysis). tPA enzyme catalyzes the conversion of plasminogen to plasmin. tPA can used in embolic or thrombotic stroke research. t-PA is a proteolytic enzyme found in blood and tissues. The major physiological function of t-PA is to generate plasmin that can dissolve blood clots in the vasculature. Recent studies suggest that reduced t-PA activity and elevated t-PA and PAI-1 antigen levels may be a risk marker for cardiovascular disease. Function: Activates plasminogen into plasmin. Importance: Decreased t-PA activity and elevated t-PA and PAI-1 antigen may be a risk marker for cardiovascular disease. Blood coagulation is an enzymatic event initiated by substances from injured tissues and culminating in the formation clot-forming fibrin monomers. After a few days, the fibrin clot is degraded by the fibrinolytic enzyme system. The central enzyme component in this system is the glycoprotein plasminogen present in plasma and most extravascular fluids. Plasminogen is a zymogen of a serine protease which, following partial cleavage by a plasminogen activator, is converted into its active form plasmin. Plasmin is involved in a variety of biological processes, including cell migration, growth, inflammation and tumour invasion, although its primary function is assumed to be lysis of fibrin in the vasculature. Two plasminogen activators have been found in the human body, the tissue-type plasminogen activator (t-PA) and the urinary-type activator (u-PA). t-PA is the principle activator of plasminogen in blood, whereas u-PA has its major function in tissue-related proteolysis and is believed to only be secondary to t-PA in the removal of intravascular fibrin. Fibrinolysis is initiated and propagated mainly by the fibrin surface, which offers binding sites for an optimal contact between a number of the components of the fibrinolytic system, most notably plasminogen and t-PA. This stimulatory effect ensures a high concentration of plasminogen and t-PA at the fibrin deposits and localizes the plasmin activity. Inhibitory regulation is provided by the plasminogen activator inhibitor-1 (PAI-1) and the plasmin inhibitor. PAI-1 is the most efficient inhibitor of t-PA in plasma and the majority of circulating t-PA is bound to this inhibitor. Normally, there exists a carefully regulated balance between the formation of fibrin and its subsequent removal. However, in certain pathological conditions and in hereditary deficiencies, this balance is disturbed. Subjects with an inherited increase of fibrinolytic activity usually have severe bleedings. In contrast, a decreased fibrinolytic activity may be associated with thrombotic disease. The fibrinolytic system in vivo. Plasminogen is the proenzyme of plasmin, whose primary target is the degradation of fibrin in the vasculature. 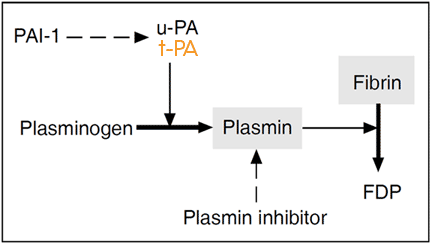 The activation of plasminogen to plasmin in blood is catalyzed by t-PA secreted from endothelial cells. Fibrin provides binding sites for both plasminogen and t-PA, thereby optimizing contact between them. This mechanism ensures a high concentration of plasminogen and t-PA at the site of fibrin formation and localizes the action of plasmin. Further regulation of the system is provided by PAI-1 and plasmin inhibitor. Free t-PA, as well as complexed t-PA/PAI-1, is cleared from the circulation by receptors in the liver. Abbreviations: t-PA; tissue-type plasminogen activator, PAI-1; plasminogen activator inhibitor 1, FDP; fibrin degradation products. Human t-PA is a 68 kDa serine protease composed of 530 or 527 amino acids and containing between seven and 13% carbohydrate. The molecule, is made up of five distinct domain structures with autonomous functions. The finger domain and the two kringle domains are involved in the binding of t-PA to fibrin, whereas the epidermal growth factor domain is implicated in the rapid hepatic clearance of the molecule. The serine protease domain contains the active site region made up of serine, histidine and aspartic acid, which are situated relatively far apart from each other in the primary structure, but are in close proximity in the folded protein. This region cleaves the Arg561-Val562 bond in plasminogen and thus activates it to plasmin. Domain structure of the human t-PA molecule. Abbreviations: F; finger domain K1-2; kringle domains, EGF; epidermal growth factor domain, P; serine protease domain. 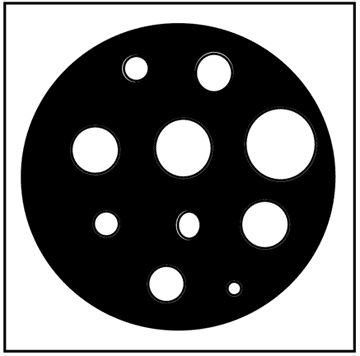 The catalytic triad made up of His322, Asp371 and Ser478, is illustrated by black dots. The cleavage site for converting the molecule into the two-chain form is shown by an arrow. Disulfide bridges are marked as thin lines. t-PA is synthesized mainly in vascular endothelial cells and is secreted into the plasma continuously and also through the acute release of t-PA. The latter situation occurs upon stimulation of certain endothelial cell receptors. Different regions of the vascular system secrete different amounts of t-PA. Upper extremities secrete about four times more t-PA than that of the lower extremities. There are two forms of t-PA, single-chain t-PA (sct-PA) and two-chain t-PA (tct-PA). The single chain molecule is the native form of t-PA secreted from endothelial cells, whereas the two-chain form is the result of the proteolytic activity of plasmin. Both forms are catalytically active and have similar enzymatic properties in the presence of fibrin. t-PA is a relatively poor activator of plasminogen in the absence of fibrin due to the low affinity of t-PA for its substrate. Although, t-PA has a high affinity for fibrin and binding increases its activating capacity up to 1,000-fold. This dramatic increase is attributed to specific binding sites on the fibrin surface that concentrate and correctly orientate t-PA with its substrate, as well as promoting efficient clot lysis. The baseline concentration of t-PA in plasma taken in the morning from a healthy person at rest, is approximately 5 µg/l when measured using immunological methods, and about 1 μg/l (corresponding to about 0,5 IU/ml) if measured functionally. This discrepancy between antigen and activity levels can be attributed to the fact that most of t-PA in plasma occurs in non-functional complexes, mainly with its principle inhibitor PAI-1. An acute increase in t-PA levels is observed in response to stimuli, such as exercise, mental stress, venous occlusion and various drugs. t-PA is removed from the circulation by a rapid clearance mechanism in the liver. The normal half-life is about 4 minutes for free t-PA, although the half-life may decrease considerably if PAI-1 levels are elevated, as is the case in many subjects with a thrombotic tendency. When an isolated rat liver perfusion system was studied it was shown that the t-PA/PAI-1 complex is cleared twice as rapidly as that of free t-PA.
A number of inhibitors have been identified in plasma and other body fluids with the capacity to inhibit t-PA, including PAI-1, PAI-2 (placenta plasminogen activator inhibitor), PAI-3 (protein C inhibitor), protease nexin, α2-macroglobulin, trypsin inhibitor and CI-inhibitor. Plasminogen activator 1 (PAI-1) is the most efficient inhibitor of t-PA in plasma. It is a typical serine protease inhibitor (serpin) that acts as a pseudosubstrate for its target protease, with which it forms an equimolar and inactive complex (i.e active site binding). PAI-1 is unique in the serpin family, in that the molecule exists in two forms. One form is active, but spontaneously loses its activity and has a halflife of 0,5 hour. The second form is a non-active decay product of the active molecule. The reason why PAI-1 undergoes this change is unclear. PAI-1 is synthesized by several cell types including endothelial cells and hepatocytes and is present in platelets, placenta and serum. Antigen determinations show that platelets contain up to 90% of the total amount of PAI-1 in blood. Platelet PAI-1 is available for release when the platelets are activated, but is much less active than plasma PAI-1 in relation to the amount present. However, it has been calculated that platelet derived PAI-1 accounts for some 50-80% of the total PAI-1 activity, by virtue of their mass. The normal concentration and activity range of PAI-1 in plasma is reported to be 5-40 μg/l and 0-40 IU/ml, respectively. This large variability is partly due to the marked diurnal variation in PAI-1, with lower values in the afternoon than in the morning. PAI-2 is a 47 kDa serpin with a higher affinity for u-PA than for t-PA. While hardly detectable in nonpregnant plasma, levels up to 100 μg/l are observed in the third trimester of pregnancy. It does not inhibit sct-PA and is 100-fold less effective as an inhibitor of tct-PA than PAI-1. The more efficient inhibition by PAI-2 of u-PA indicates that its primary role may be in regulating extracellular u-PA. The interaction between t-PA and PAI-1 and their coordinated apperance in plasma is highly complex. The total amount of t-PA and PAI-1 antigen in plasma usually show a strong positive correlation, suggesting that synthesis and/or clearance of t-PA and PAI-1 are biologically linked. However, an increased t-PA production due to increased PAI-1 levels does not automatically result in increased amounts of active t-PA. Instead, t-PA activity appears to show a negative correlation with both PAI-1 and t-PA antigen. This latter correlation may seem confusing, since the increase in the total amount of t-PA results in a decrease of t-PA activity. Relationships between t-PA antigen, PAI-1 antigen and t-PA activity (BIA) in plasma from 25 healthy subjects. preoperative values of increased PAI-1 appeared to be predictive of postoperative venous occlusion. Studies regarding a reduced t-PA activity and elevated PAI-1 levels as a risk factor for thromboembolic disease remain to be further evaluated. Baseline levels of PAI-1 and t-PA antigen, do not appear to predict the occurence of DVT or pulmonary embolism among healthy individuals. t-PA and PAI-1 have in several independent studies been identified as risk markers for cardiovascular disease. Elevations of t-PA antigen have been linked to persons at risk in several studies involving cardiovascular events in subjects with angina pectoris and coronary artery stenosis, myocardial infarction (MI), and stroke. Furthermore, a strong support for the link between PAI-1 elevation and risk of having a MI was obtained from a study of men who had survived a first MI before the age of 45 years. Reduced t-PA activity has been reported as predictive for MI, for MI in subjects with angina pectoris, and in ischaemic disease in younger men. The results from these studies put together suggest that a state of elevated t-PA and PAI-1 antigen and reduced activity is the condition associated with cardiovascular disease. The production of t-PA and u-PA by leukemic cells can be used to predict the prognosis and response to chemotherapy in subjects with acute myeloid leukemia. Subjects whose cells produce only t-PA have a lower chance of survival and fail to respond to chemotherapy. In contrast, subjects with u-PA producing cancer cells have a higher chance of survival and a better response to chemotherapy. Cardiovascular diseases, such as acute myocardial infarction, stroke, and venous thromboembolism, are probably the major cause of death and disability in an adult population. The immediate underlying etiology in these conditions is often a thrombotic obstruction of critically situated blood vessels, causing a loss of blood flow to vital organs. One approach to the treatment of thrombosis consists of the intravenous infusion of plasminogen activators as clot-dissolving drugs. Reduction of infarct size and mortality has been obtained with streptokinase (SK), anisoylated plasminogen streptokinase activator complex (APSAC), and recombinant t-PA (rt-PA). rt-PA is probably the most effective thrombolytic agent as fibrin affinity of t-PA not only localizes the catalytic activity to the clot, but it also increases its catalytic efficiency. rt-PA in combination with the adjunctive infusion of the anticoagulant drug heparin recanalizes approximately 75% of occluded coronary arteries within 90 minutes and reduces mortality by about 25%. The use of thrombolytic agents may occasionally require close monitoring of the components of the plasminogen activation system. Excessive thrombolytic activity is likely to cause bleeding, particulary cerebral hemorrhage, as a side-effect. Plasma levels of t-PA and PAI-1 in healthy, active young subjects over a 24-hour period using blood sampling in Stabilyte® media and BIA t-PA analysis in water. An intriguing feature of the fibrinolytic system is the circadian variation in t-PA and PAI-1 that has been observed. Free t-PA levels are lowest in the morning, increase during the day and reach their peak activity level in the late afternoon. t-PA and PAI-1 antigen are highest in the early morning and decrease during the day. It has been suggested that the high incidence of myocardial infarction and cerebral thrombosis in the morning hours, may be connected to the circadian rhythm of fibrinolytic activity. From mortality statistics in Greenland it is known that Eskimos have a low prevalence of myocardial infarction. This has been related to their diet, although it may also be due to the observation that Eskimos have a rapid increase in t-PA activity in the morning and a more rapid decrease in PAI-1 activity and antigen compared to Caucasians. Because of the diurnal variation in fibrinolytic activity, sampling should always take place at the same time during the day (usually between 8 a.m-9 a.m). Different stimuli, drugs, and environmental factors have been reported to modulate the fibrinolytic activity in the experimental animal as well as in humans. Examples of these are listed below in alphabetical order. Age has little influence on t-PA or PAI-1 activity, although t-PA antigen levels are correlated to increasing age. Most reports on alcohol and fibrinolysis show an increase in plasma PAI-1 levels following alcohol consumption that causes an acute decrease in t-PA activity. In a recent study of moderate alcohol consumption in a group of healthy men, it was observed that t-PA activity falls sharply after alcohol intake for the first 5 hours, although it then rises and becomes significantly higher after 13 hours. Moderate alcohol consumption may therefore be associated with a lower risk of coronary heart disease ‘the day after’. Stanozolol produces profound change in the coagulation and fibrinolytic systems after prolonged oral administration. A significant decrease in t-PA and PAI-1 activity has been reported. 1-deamino-8-d-arginine vasopressin or DDAVP induces a powerful release of t-PA, factor VIII and von Willebrand factor when injected into humans. Peak t-PA concentrations are seen after 40 to 60 minutes of administration. Subjects who are poor responders in the venous occlusion test may show efficient t-PA release after DDAVP. A rise in the fibrinolytic activity after exercise has been reported by many authors and attributed mainly to the acute release of t-PA from the vascular endothelium. The increase in t-PA activity is related to both the intensity and the duration of exercise and may reach 30 times the normal after a Marathon race. When comparing physically active and inactive men, it was found that t-PA activity increases more in active men and that they have a lower PAI-1 activity. A diet rich in high-complex carbohydrates and low in fat has been reported to lower both t-PA and PAI-1 antigen. The net effect was an enhancement of fibrinolytic potential, due to the greater fall in PAI-1. When comparing fish with lean meat, it has been observed that a fish diet leads to higher t-PA and PAI-1 antigen levels. Basal t-PA activity may increase following a 24 hour fast. This is probably a secondary reaction due to decreased PAI-1 activity. Heparin can form 1:1 complexes with t-PA. The complex has higher catalytic activity for plasminogen activation than t-PA alone, but heparin appears to inhibit the potentiating effect of fibrin on t-PA-induced plasminogen activation. Prolonged administration of unfractionated heparin and LMW heparin, induces a rise of circulating t-PA antigen levels. The release of t-PA from the endothelium may be involved in the pathogenesis of anaphylactic shock induced by insect venom. Levels have been found to increase about 10-fold following a controlled insect-sting challenge in subjects with a previous history of insect-sting induced anaphylactic reaction. Mental stress releases t-PA 54 in a similar manner to that of adrenaline, 55 with increases in heart rate and systolic and diastolic blood pressures. Stress-induced release must be avoided during blood sample collection. The subject must rest both mentally and physically for 20-30 minutes prior to venepuncture. Oral contraceptives may produce a significant increase in t-PA activity, not due to decreases in PAI-1 or plasminogen concentration. Pregnancy induces marked changes in the coagulation mechanism and fibrinolytic system, changes that aim to secure hemostasis during pregnancy and delivery. The increase of t-PA antigen and the decrease of PAI-1 antigen and activity after the 38th week contributes to sustain a fibrinolytic potential capable of degrading large fibrin deposists. Chronic smoking induces higher baseline levels of t-PA and PAI-1 antigen and lower t-PA activity. In addition, the release of t-PA after a venous occlusion is impaired in chronic smokers. The venous occlusion test is often used to test subjects for their capacity to release t-PA from the occluded venous segment. A test takes 5-20 minutes and involves a blood pressure cuff on the upper arm, inflated midway between the systolic and diastolic blood pressure. The t-PA activity rises 3-12 fold and antigen levels increase 2-6 times. Comparison of preocclusion with the postocclusion blood sample gives an estimate of the fibrinolytic capacity of the individual. A large variety of methods for measuring t-PA levels in human plasma have been described. These can be divided into specific t-PA assays, and non-specific global tests. Two common methods today are the global, euglobulin clot lysis time and the fibrin plate assay. Specific t-PA assays include immunological methods which measure t-PA antigen (i.e. both free t-PA and t-PA/PAI-1), and functional methods. The latter are either chromogenic assays using chromogenic plasmin substrates and stimulators, or bioimmunoassays that use a combination of monoclonal antibodies and chromogenic plasmin substrates. In recent years there have been considerable improvements in the methodology of blood collection routines and sample handling. As large number of variables influence fibrinolytic activity it is important to standardize as many aspects as possible of blood collection. Samples should be taken in the morning (8 am- 9 am) from a subject who has been fasting, although a light breakfast without fat and tea or coffee can be chosen. Smoking must be avoided for at least one hour and alcohol for at least 24 hours prior to taking the sample. It is also important that the subject is resting mentally and physically prior to venepuncture. In vivo, the concentration of active t-PA is regulated by endothelial secretion, hepatic clearance, and PAI-1, which results in a relatively stable steady-state level of active t-PA. However, when a blood sample is taken the secretion and clearance mechanisms are removed. PAI-1 will therefore continue to react with free t-PA unless preventive measures are taken. The collection of plasma at low pH (about pH 6) using Stabilyte® tubes is an effective way of “freezing” the in vitro complex formation between t-PA and PAI-1. This requirement to prevent t-PA complexing in vitro is not important for immunological assays of total t-PA antigen (free plus complexed), but is essential for assays measuring t-PA activity. The latter type of test includes chromogenic substrate assays and bioimmunoassays. 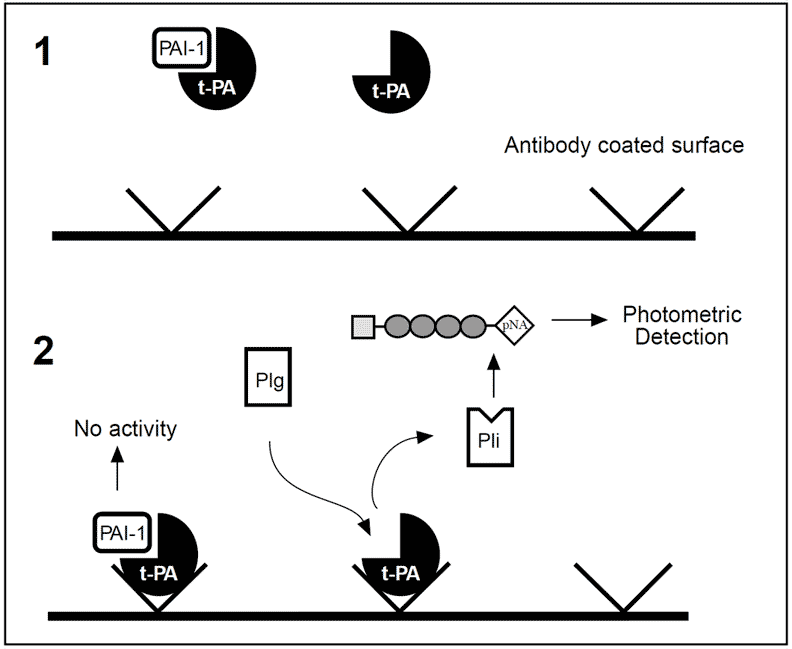 t-PA activity assays utilizing the technique of immobilized antibodies for adsorbing t-PA from plasma is referred to as a BIA or bioimmunoassay. Bioimmunoassay for t-PA.  Microplate wells are coated with a monoclonal anti-t-PA antibody that binds t-PA without interfering with its active site. A mixture of Glu-plasminogen (Plg) and a chromogenic plasmin substrate is added. t-PA activates plasminogen to plasmin (Pli), which causes the chromogenic substrate to release pNA (yellow color). The amount of pNA is proportional to the amount of active t-PA originally present in the sample. In the first step, t-PA complexes to an immobilized monoclonal anti-t-PA antibody (without blocking the active site) and unbound proteins are washed away. This results in the complete removal of interfering factors. In the second step, human Glu-plasminogen and a chromogenic plasmin substrate are added. Plasminogen is converted to plasmin by the active t-PA, and the plasmin generated cleaves the chromogenic substrate, releasing pNA. The amount of pNA released is proportional to the amount of t-PA originally present in the sample and is measured photometrically. The sensitivity of the bioimmunoassay makes venous occlusion tests optional and the active t-PA can be measured directly using undiluted plasma. ECLT is a global test that measures the fibrinolytic potential in plasma, and is used for estimating the t-PA activity. The basic idea is to separate the inhibitors that interfere with the assay from the components with fibrinolytic activity. Citrated plasma at 4ºC is diluted and acidified with acetic acid. The precipitated euglobulin fraction is then separated by centrifugation, resuspended in a buffer and clotted by adding thrombin. The time taken for the clot to lyse is measured visually or using an automated clot lysis recorder. Fibrinolytic activity is inversely proportional to the lysis time. Normal values are approximately 2 to 8 hours and 20 minutes to 1 hour following venous occlusion. The major disadvantage with clot lysis time is that it is not only affected by activator content but also by the levels of inhibitors and the fibrinogen and plasminogen content of the sample. Principle of a fibrin plate test. Euglobulin fractions are placed on the fibrin plate and incubated overnight. The white circles represent digested fibrin and the grey area undigested fibrin. 1-5 are standard solutions. 6-10 are samples with different fibrinolytic activity. The white lysed area is proportional to the fibrinolytic activity. The fibrin plate assay measures the fibrinolytic activity by calculating the amount of lysis produced by a standard volume of euglobulin fraction applied to a standardized plasminogen-rich fibrin plate. The test is more accurate than clot lysis time, although as it is time-consuming and labor intensive it is not suitable for acute situations. Commercially available t-PA antigen kits are generally the enzyme-linked immunosorbent assay (ELISA). In contrast to the functional activity assays in which only free t-PA is measured, immunological methods also include the non-functional t-PA bound to inhibitors. The two most common t-PA/inhibitor complexes are t-PA/PAI-1 and t-PA/plasmin inhibtor. Chromogenic substrate assays measure indirect determination of t-PA by a plasmin-mediated reaction. The majority of these assays employ different types of fibrin-like stimulators (e.g. soluble fibrin, fragmented fibrin(ogen), poly-L-lysine) to enhance the activation of plasminogen by t-PA.